Found this on an online auction and just had to have it. I have an extreme aversion to all of the bug-eyed children art of the late 60s and seventies but this has A SCOOTER ON IT. No markings on this except “USA” imprinted on the bottom so we have only ourselves to blame folks. I do have to say I think this must have been for a kid because only a shot and a half of espresso fits in this thing. Or were coffee cups just smaller back then? Does anyone remember? 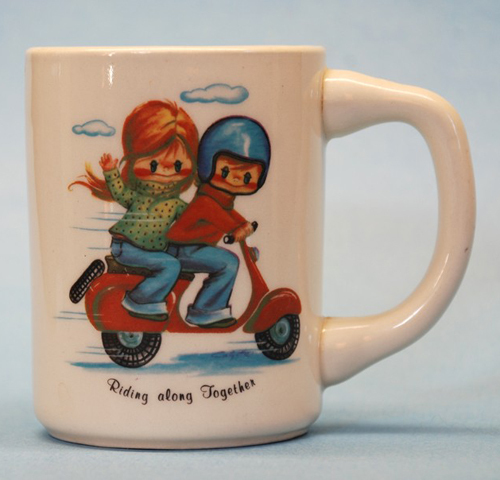 This entry was posted in Ceramics, Pottery and tagged coffee cup, mug, precious moments, scooter, vespa, vintage by Tracy. Bookmark the permalink. The mug looks really cute and sweet. This is nice to be given as a gift.